Poking around with a sharp tool I came across 2 articles I wrote published by Spirituality & Health Magazine on Ecstatic Dance. First, a little history (or “her-story”): My first “Sweat Your Prayers” dance was in Houston, Texas, in 1989. We danced Gabrielle Roth’s five rhythms — Flowing, Staccato, Chaos, Lyrical, and Stillness — evoking the prescribed emotions of fear, anger, grief, hope, and compassion. We danced in Spandex and running shoes. More important, we danced vertically, not rolling horizontally on the floor, and we rarely touched one another. In 1994, three of us moved to Austin and started a new kind of dance. With Gabrielle Roth’s blessing, we borrowed her 5Rhythms, but our goal was to expand the boundaries of touch and intimacy. We wore cotton and danced barefoot. Our guidelines were to “bare your soul,” be nonverbal to hear each other’s heartbeat and breath, and keep our eyes open to witness authenticity. Often, we all ended up in a heap. In 1996, we changed the name of our dance from Sweat Your Prayers to Body Choir. Our dance expanded from 90 minutes to two hours, to include a warm-up, opening circle, and closing share-back with community announcements. Our goal was to build community through dance. 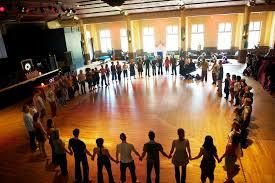 We touched and partnered as a primary dance expression, rather than dancing the five rhythms. To touch or not to touch, and to partner or not to partner, became a great divide in ecstatic dance. Today, Conscious Dancer magazine lists 134 variations of ecstatic/freestyle dances offered throughout North America, Europe, Latin America, and Australia. The dance now integrates Hula-Hoops, hip-hop, and Acro yoga with Contact Improvisation and Authentic Movement. Music varies from electronic mixes, kirtan chants, and tribal drums to tango and classical ballet. I like to think that ecstatic dance, in all its forms, is popping up to slow down human soul erosion — in all its forms. A. Be Aware of the Dance Agreements. Is it a Dance Jam? Barefoot Boogie? Sweat Your Prayers? Dance Jams and Boogies are usually social and improvisational, and they embrace a diversity of expressive movement that includes Hula-Hoops, Contact Improvisation, and/or Sufi spinning. Sweat Your Prayers more likely is a solo class that dances the five rhythms, specifically guided by a certified 5Rhythms teacher. This usually means no touch or Contact Improvisation and specifically follows a Wave with guided dance movements. Carola Marashi is the co-founder of Body Choir in Austin, Texas, and Ashland, Oregon.